Imagine hospitals around the world deploying onsite renewable energy and super-efficient building design. Imagine cancer centers built without chemicals that cause cancer. Imagine health centers that provide clean water and healthy food for their communities. Imagine hospitals that minimize waste generation and practice water recycling. Imagine the health sector as a beacon of and advocate for low-carbon development. Imagine Global Green and Healthy Hospitals. 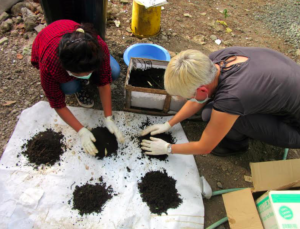 GGHH brings together hospitals, health systems, and health organizations from around the world under the shared goal of reducing the environmental footprint of the health sector and contributing to improved public and environmental health. 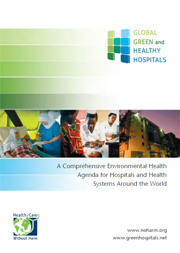 The framework and roadmap to reach this goal is provided by the GGHH Agenda and its 10 interconnected sustainability goals for hospitals and health systems to work towards at their facilities. With the launch of the Health Care Climate Challenge at the Paris Climate Conference in 2015, the GGHH Network is increasingly working to mobilize health care to reduce its own carbon footprint, become more climate resilient, and exert leadership to help every society transition to a low carbon energy future.